As you may recall, a few weeks ago I contributed to an article called “The Ultimate Summer Catering Guide” that was published in 20 newspapers across the country. In that article I offered advise on what menu to serve for a laid-back summer soiree. What you didn’t read was my suggestions on types on summer parties that are not typical. 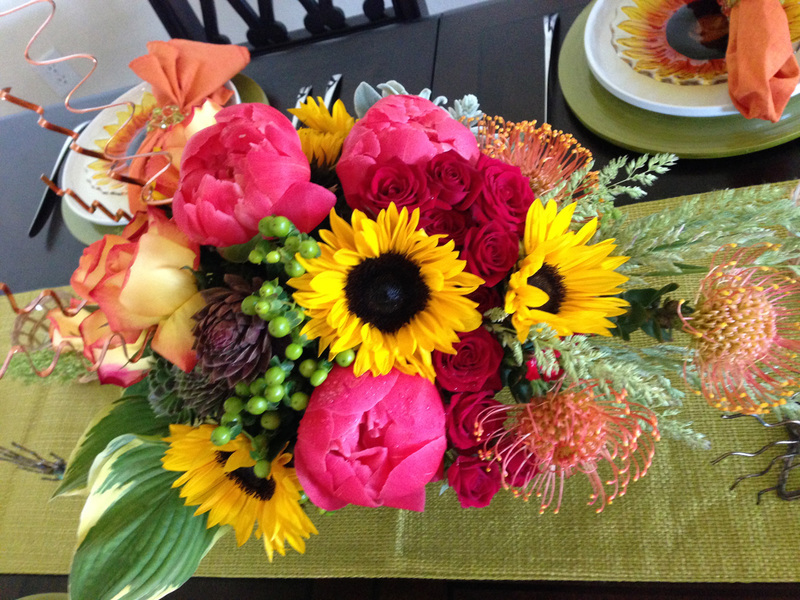 My favorite suggestion…a Summer Solstice Party! For those who don’t know, the Summer Solstice is the day with longest amount of sunlight in the calendar year. So it’s truly the quintessential summer time party. Even though the idea wasn’t published in the article I decided to throw my own Summer Solstice Party. Using a color scheme of yellows, oranges and reds, I tried to emulate the sunset as much as possible. 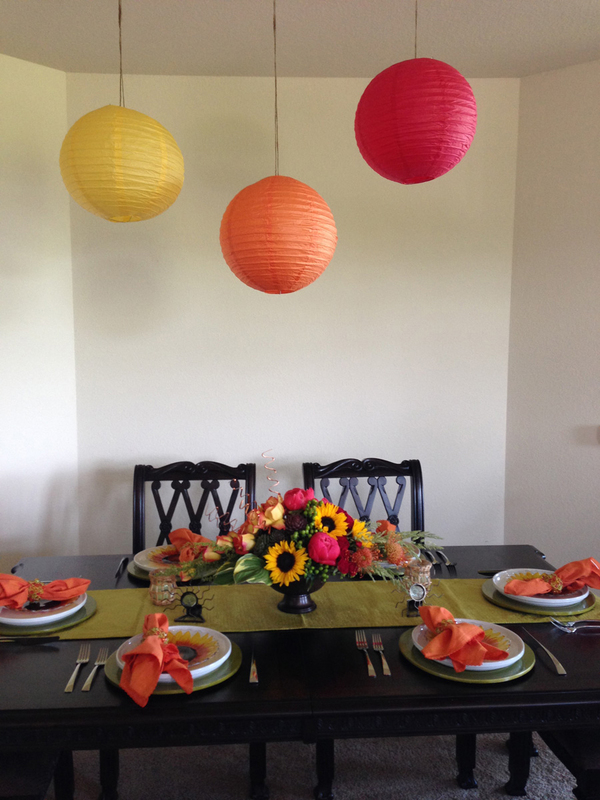 The floral centerpiece – filled with sunflowers, peonies, roses and succulents – was accented by the hanging lanterns from the ceiling and sun-shaped candle holders. 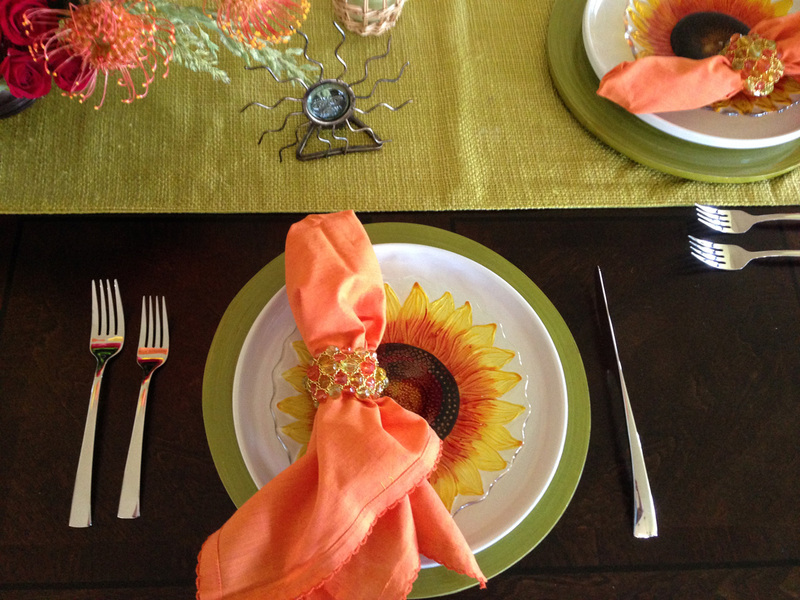 The place setting was a green gold-glitter charger with bone white china and sunflower bread plate. An orange napkin with beaded napkin ring topped off the look. Most of the decor are pieces I had hanging around my home that can be found in Marshalls and Pier One. 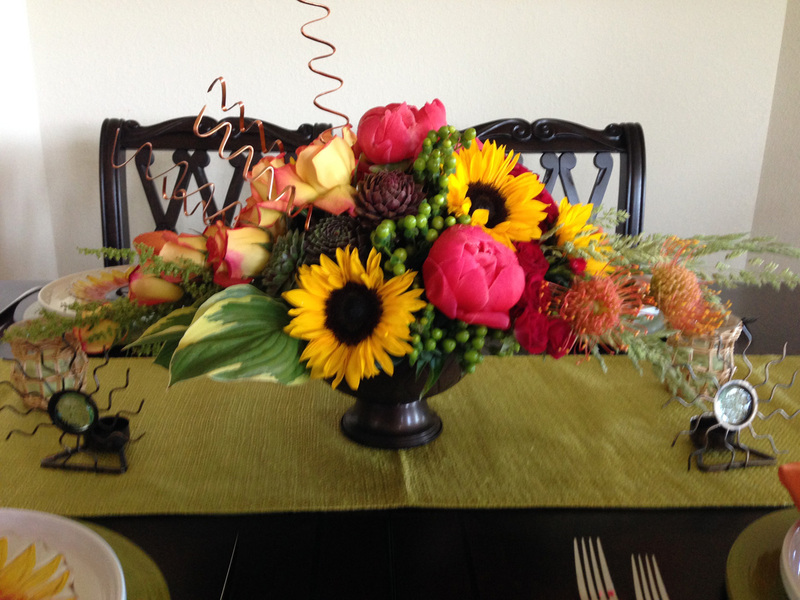 The INCREDIBLE floral centerpiece was provided by Pteris Floral Design in Milwaukee. 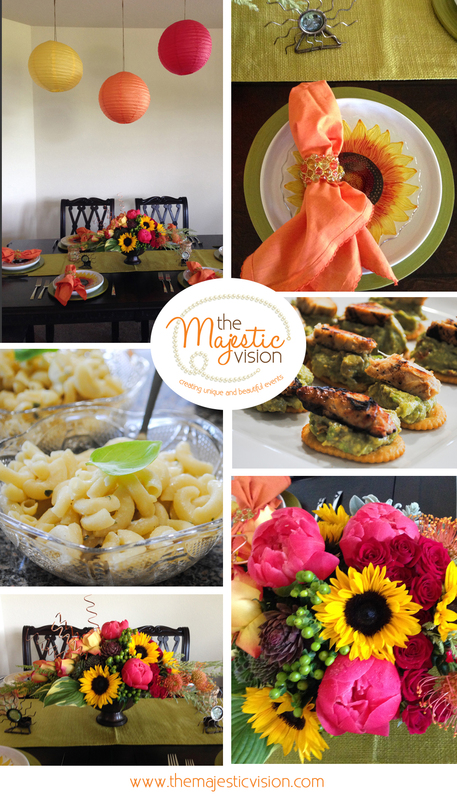 My guests were treated to some yummy goodness in terms of food. We started with a few appetizers. 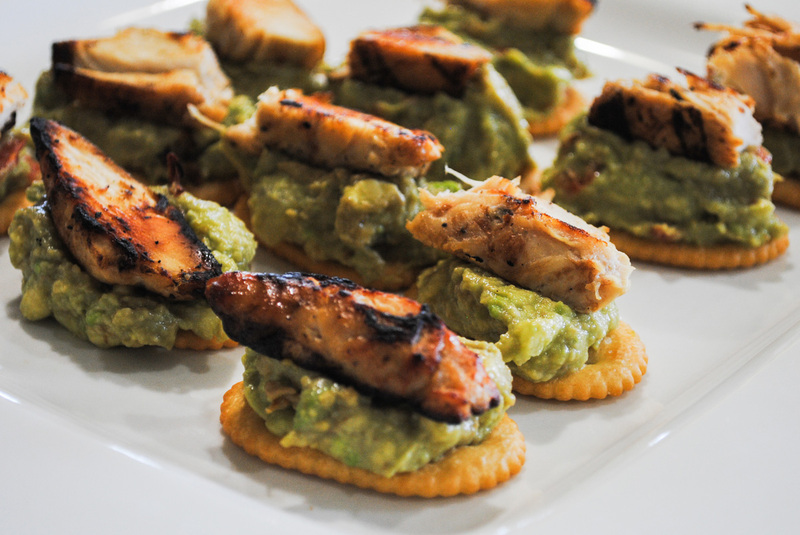 First (and most tasty in my book), was the Chicken Tostada with Avocado Salsa. It’s super easy to make and looks pretty once assembled. I began by grilling up strips of chicken. You can buy already cut into strips or grill the chicken breast and then slice yourself, whichever you prefer. Then I made an avocado salsa, which is a basic guacamole with added salsa for extra flavor. Again, you can make this from scratch by combining chopped avocado, onion, red and yellow bell peppers, salt, sugar and lime juice for the guacamole. Then add in your salsa (tomatoes, cilantro, garlic, onion and olive oil). Once the 2 are combined, it should make for a hardy dip. Top your tostada or cracker with the dip and then the chicken strip. Looks good and tastes great! 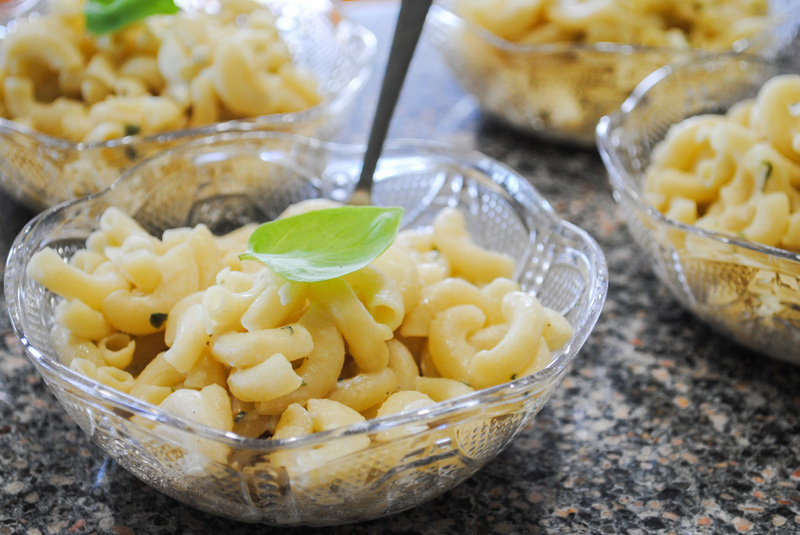 The second appetizer to be served was a Lemon Basil Pasta Salad. This was served cold, which made it easier in the prep stages since the tostada should be served hot. I started by boiling macaroni pasta til al dente, drained and placed back in the pot. Then I added lemon juice, chopped basil, olive oil and blue cheese crumbles to the pasta and mixed throughly. Then I placed the whole dish into the fridge for an hour. Once ready to serve, I placed them in individual bowls and added a basil leaf for garnish. Delish and it made for great leftovers. 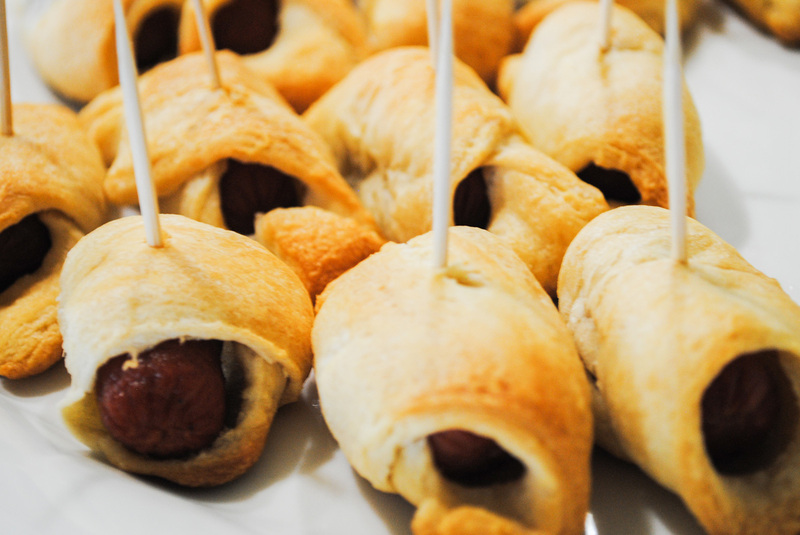 The third and last appetizer was the crowd favorite of Pigs in a Blanket or in fancier terms – Cocktail Franks in Puff Pastry. They were served with choice of dijon mustard or ketchup. If you have never made Pigs in a Blanket, they are super easy. Purchase cocktail franks and Pillsbury Crescents. The crescents come pre-sliced into 8 triangles. I just cut those into smaller triangles that were the width of the franks. Roll the franks snuggly with the triangle puff. Bake as indicated on the packaging. Then add toothpicks for easy sharing with guests. Sounds like a lot, right? That’s exactly what my guests said but I was already mid-way through cooking dinner by then, so they left my house VERY full. 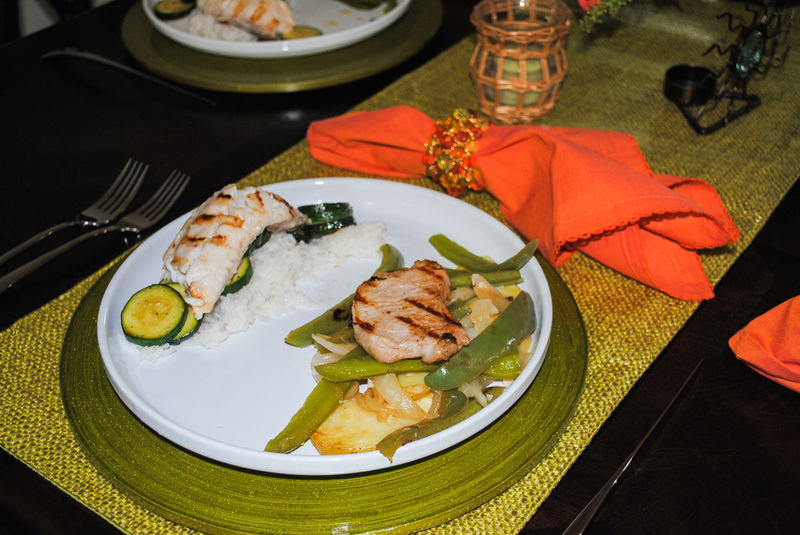 For dinner, I offered guests a duo dish of Lemon Pepper Pork Chops over Roasted Potatoes, Sautéed Green Pepper and Onion AND Citrus Tilapia over White Rice and Sautéed Zucchini. A bonus to a duo dish is that you can make complementary dishes in smaller portions so that all your guests are happy. For the pork chops, I created a lemon pepper marinade using lemon juice, garlic, olive oil, black pepper and chicken stock. Then let the pork chops marinate for 3 hours making them very juicy. We cooked them on the grill and served on top of the extras. Those extras of sautéed veggies and potatoes were all done on the stove top. For the tilapia, I also created a marinade but the base was oranges instead of lemon. This way the dishes had similiar tastes but with obvious differences. The rice was made in the rice maker and we sautéed the zucchini on the stove top. All in all, it was a team effort in timing the cooking with my husband and the end result was divine.